Another tough NCHC test awaits the Mavericks this weekend as they take on the Western Michigan Broncos. I worry that some fans will underestimate Western Michigan based on the previous history between these two teams (UNO is 25-18-6 all time against WMU), dating back to the CCHA days. But the Broncos are for real. They are currently in third place in the NCHC, ahead of North Dakota and even Denver. They're also ranked #8 in the nation. The two teams faced off in Kalamazoo in November, and split the series. However, since then, the Broncos are 11-2-1, with their only two losses to St. Cloud State. Western is averaging 3.54 goals a game, and has five players with 20 or more points. The Mavs are 7-15-2 (3-10-1-0/1 in the NCHC). Western is 15-8-1 overall and 8-5-1-0/1 in the NCHC. Western swept Denver last weekend. The Mavs were swept at defending national champion Minnesota-Duluth. You can read what Coach Gabinet, captain Mason Morelli (happy birthday, Mason! ), and forward Zach Jordan had to say about the upcoming series in the Tuesday Weekly Media Availability write-up. Both games will be televised statewide on NET Sports. Dave Ahlers will have the play-by-play, and #oldbull David Brisson will provide color commentary. Thor Tripp, from KETV, will report. The games will also be available on Fox College Sports Central. Both games will also be streamed on NCHC.tv ($). The games will also be broadcast live on 1180 AM (Zone 2). 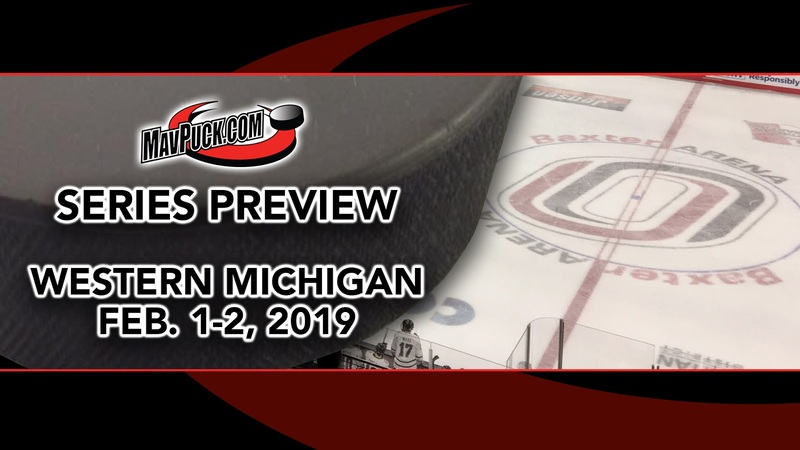 Donny Baarns will once again substitute for Dave Ahlers with the play-by-play, Terry Leahy will provide color commentary, and Lester St. James will add his usual “Lester” insights. Coverage begins at 6:37 p.m. with the First National Bank Pre-Game Show. Next up: The UNO Hockey team travels to Oxford, Ohio to face NCHC foe Miami, Feb. 8-9, 2019. Friday's game starts at 5:38 p.m. Central and will be shown on CBS Sports Network (blurgh). Saturday's game starts at 6:05 p.m. Central.